Teamwork makes the dream work. There's no "I" in team. There are countless sayings because it's such an important aspect to many things in life...including sailing. 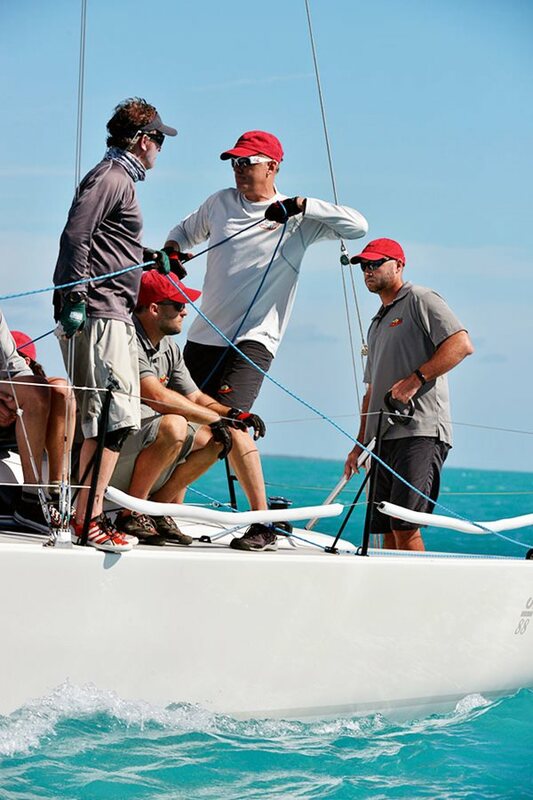 Quantum's Karl Felger knows first hand the value of this sentiment and details the importance of teamwork in the J/88 Spaceman Spiff's Quantum Key West Race Week campaign. Taking Names - The J/88 Spaceman Spiff sails competitively at Quantum Key West Race Week. Photo by PhotoBoat.com/Quantum Key West Race Week. Recognition for a successful sailing campaign usually goes to the skipper and/or owner of a boat. Whether at the podium, on the trophy, or in a press release, their names are front and center. This is rightfully deserved, as they are primarily responsible for the funding, management, and actions of a sailboat. However, most seasoned race teams know that success would not be possible without the commitment, hard work, and skill of the entire team. 2017 was my first time attending Quantum Key West Race Week (KWRW), let alone sailing, though I’ve monitored the event from afar for many years. I was slated to crew for Ryan Ruhlman’s J/88 Spaceman Spiff, and, to be honest, the Friday afternoon practice was the first time I’d stepped foot on a J/88. I had sailed on similar boats, but it was still a daunting task. I can admit that I had a certain level of anxiety going into the event, as I was responsible for the readiness of our boat and our boat speed. Fortunately, I had a big asset on my side that many KWRW veterans have relied on for years – teamwork! To succeed, we relied on the many talents of our immediate team, as well as the team around us. We not only followed the Quantum Sails tuning guide to keep the boat up-to-speed across all wind ranges, we spent time on the docks asking about the finer points of the J/88 (including talking to Quantum’s J/boat expert Kerry Klingler). The idea of teamwork extends beyond the on-baord team and involves many players throughout the class. It’s important to recognize this, as it was a strong part of our success. Many teams forget this and miss the opportunity to share information and gather insight from other sailors. Fortunately, our team trusted each other, and, what we lacked in experience, we made up for by being willing to ask questions and learn from those around us. We ended up third overall at KWRW, and I’m quite pleased with this result. It improved on the 2016 results, and we felt that we left it all on the race course. Many of our competitors were more experienced on the J/88, but we made up for our inexperience by working to improve and never giving up. I am proud to call Ryan Ruhlman, Maegan Ruhlman, Bill Faude, Matt Frymier, and Jeff Hasse my teammates. Experience matters, but good teamwork (and knowing how to build it) can make a big difference. Remember, there is already a strong support network around you, including your local sailmakers, hardware suppliers, boatyards, and yacht clubs. They invest a lot of time and resources into you, so don’t hesitate to take advantage of it – let them be part of your on-shore team.